The last Friday of MSBA ’18. That just seems wrong. The fact that tomorrow marks the end of the best summer of my life has yet to sink in. Everyone always says that your time in MSBA flies by, and I couldn’t agree more! I’m still not really sure where the time went, but this summer has created so many opportunities for my future and has left me with some of the most amazing memories. Last time I wrote a blog, I quoted something my grandpa said. Well, sorry guys, I’m about to do it again! On the same trip (the man must have been feeling very inspirational that week), my grandpa said, “It’s not the days we remember, it’s the moments.” Here we have yet another quote that my grandpa definitely didn’t make up, but used at an appropriate time. I don’t remember what we were seeing that day, where we were geographically, or what day of the trip it was. All I remember is him saying that, so I guess that’s one example of how valid this quote is. Of course, young Anika thought her grandfather was once again crazy. But just like with the previous quote, I have learned to understand how right he was. Of course MSBA has left me with amazing professional memories, but the ones I will really cherish are the ones that I have made with those who were on this journey with me. The days start to bleed together into one. I mean, can you blame me? We were working all day and networking and learning about the industry at night. We were all out here grinding (and by the way, the grind is amazing)! The moment I was accepted into MSBA. I was sitting in my dad’s office over winter break. Lorne and Bailey really siked me out and convinced me that I hadn’t made it into MSBA. I can’t even describe how I felt and how excited I was in the moment that they told me that I had made it into the program. I remember the first time I met my roommate. I signed her into EHS the week before the program started to watch Game 2 of the NBA Finals (Go Warriors!). I wasn’t sure I was going to like her to be honest, but eight weeks later she’s one of my best friends (BIG shout out to Lorne and Bailey for the roommate pairing!). When we had a hot wing-eating contest at Buffalo Wild Wings on our first night of MSBA. That broke the ice for us and allowed us to get to know each other in a crazy atmosphere. Meeting #MentorKG for the first time and realizing she may love Texas more than I love California. I honestly wasn’t sure that was even possible. The time Luke jumped into the lake at night with his glasses and had to go for a dive to find them the next morning. When Zinger ROASTED the MSBA staff at our Graduation Dinner! That time when FinkelLegend fell down some subway stairs. The first time of many that Delaney told my Amazon Alexa to “Play ‘Tequila’ by Dan and Shay” (it was 2am and I wasn’t amused). Every time Lindell and I were reminded that we were the exact same person. Going to the Bagel Shop with Peyton and Delaney for the last time. When Delaney had an allergic reaction and I took her to the ER the next morning. We still aren’t sure what caused it but we all have our own theories. Seeing Anastasia go through many phases of grief when Kawhi got traded. Seeing Bailey and John sing High School Musical at karaoke. Our very own Troy Bolton finally got his chance to shine. Watching everyone lose their minds during our Mid-Summer Gathering at the Yankees game when it was announced that LeBron signed with the Lakers. Watching John and Claudio dance to “In My Feelings” on the subway at night. Going to a Mexican restaurant in Brooklyn after our event on Avery’s 21st. These are just some of the moments that I will never forget. There are so many more that are so hard for me to even put into words. And yes, the moments we had at the NFL, NBA, CAA, MSG, and Fanatics were amazing and unforgettable, but part of what made those moments so amazing and unforgettable were the people I was with. 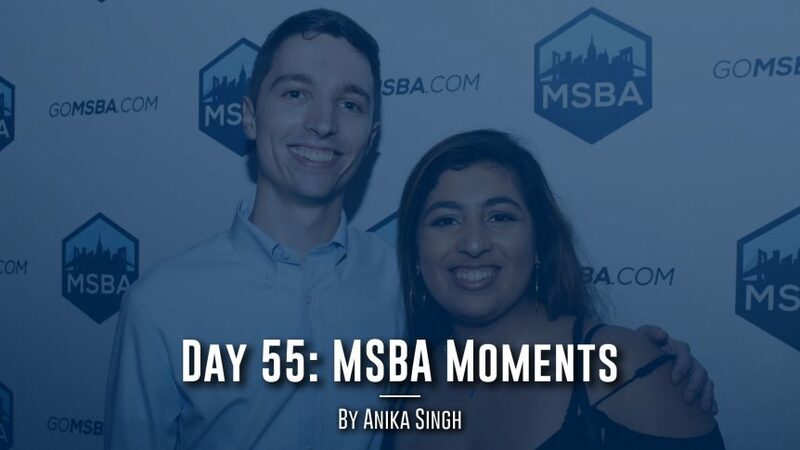 I want to thank all 26 other members of MSBA 2018! I couldn’t imagine my summer without you guys and I can’t wait for all the moments we will have in the future. With that being said, if you ever read this MSBA 2019, remember to enjoy the moments. Don’t say “no” to anything because you never know what kind of memories you will be missing out on. Rely on your MSBA family to provide you with the memories you won’t forget from the best summer of your life. I want to give a BIG shout out to Lorne, Bailey, and David for not only providing me with experiences that I will never forget, but also the people I got to experience it all with. Without you guys, I would have never gotten the chance to meet all of the amazing people in my class who will continue to be in my life after MSBA is over.